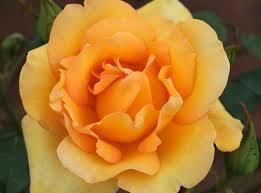 The gorgeous Gold Struck is a new Grandiflora rose with good vigor and excellent disease resistance for the type. The golden yellow color, sometimes suffused with orange, is very strong and contrasts well with the dark green foliage. The petals are beautifully rounded and flare out to about 4” in diameter when fully open. A stunner!